Note: Ravelry links will only work if you are a member. It is free to join. I just somehow happened to stumble upon the Woolly Thoughts Illusion Knitting page and was instantly amazed at how creative and intricate the pieces are. 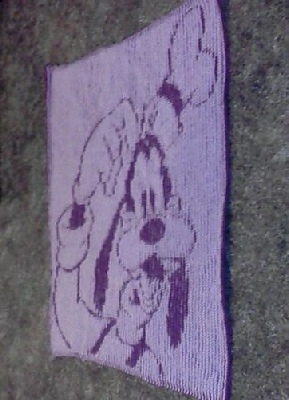 I decided that I would like to try this style of knitting and had an idea to do a Goofy blanket for my sister, Deidre, for her birthday since Goofy is her favorite character. Thanks to Steve I got all the help I needed for my first illusion knitting project, and was able to come up with the chart and begin knitting away! 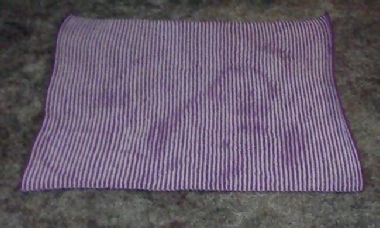 I got the idea to do this blanket from the Marilyn Monroe piece in the gallery. I decided to do four squares, each measuring 26” x 26,” connect them, and then finish it up with a border. After I finished the first square of the blanket my dad saw it and was so amazed! That made me really excited, so I have decided that my next project will be a picutre of him for Father’s Day 2012, to hang up in his office at work! Pictures of this will be posted on my ravelry page, pjprocter. Here are pictures of my progress on the blanket so far. The pictures will be updated as I finish the pieces. Stay tuned and I hope you enjoy!